With spring in the air, many of us are dusting off our bows, grabbing a handful of arrows, and heading out to the range. For some of you, archery may just be a fun way to get back outside and enjoy the return of the sunshine. For others, however, you may view springtime as an opportunity to improve your accuracy. Before you get out to the range and start practicing, review these seven tips on how to improve your archery accuracy. The point at which the bow is pulled back prior to firing is known as your anchor point. Consistency and precision here are both very important. If you’re just getting started in archery, you’ll want to experiment with your anchor points until you find the position that works the most consistently for you. Common anchor points are to place the hand that pulls the string under the cheekbone of that side and to pull the string to the tip of your nose. Again, you’ll want to experiment with this position until you find one that is both comfortable and gives you repeatedly accurate results. Go big or go home right? Well, that’s not always the case when it comes to choosing the right arrow. Some archers believe they benefit by shooting larger-diameter arrows because fatter arrows catch lines on the target’s scoring rings more easily. However, bigger isn’t always better. Arrows that are too big for your bow might not flex enough meaning they’ll miss their mark more than they hit it. So what’s the solution? Work on your shot. Bigger arrows will never be the answer or a substitute for great technique. Always feel free to ask our archery experts if you’re using the right arrow for your bow. What is your maximum effective range? Now, add 20 yards to that range and start practicing your shooting at that distance. One of the easiest, and most effective, things you can do to improve your accuracy is to practice at longer distances than your goal range. With long-distance shots, any small mistake in your shooting form will be accentuated. What would most likely be a bulls-eye hit at 20 yards can quickly turn into a wide miss when shooting from 60 yards. At first, you’ll have a hard time adjusting, but keep at it and eventually you’ll start hitting the mark from those longer distances. Once you’ve done that, your short distance accuracy will look like a chip shot. Proper stance alone is half the battle in improving your shot. However, it will increase your accuracy and power and make it easier to locate your anchor points. When shooting, your feet should be perpendicular to the target and just a bit less than shoulder-width apart. Always check your stance before raising the bow and finding your anchor point. After releasing your arrow we know it can be tempting to drop your bow and look elsewhere, but stay in your stance! The old saying “keep your eye on the ball” is just as important after your shot as it was before and during your shot. Keep the bow up and keep your focus on that target until the shot has landed. This is a habit that can greatly improve your aim and keep it steady over time. Have a friend or one of our experienced instructors watch you shoot to tell you if you’re releasing your stance too early. If you have tried the above tips and you still feel you’re shot accuracy isn’t up to the standard you want it to be, try purchasing a drop away rest. Yes, it requires putting away a little bit of money, but a drop away is an investment worth its weight in gold. For those who aren’t familiar with this product, a drop away rest lifts up your arrow into the ready position when your bow is drawn, and the rest then falls down again upon release. The effect of the drop away minimizes the amount of contact that the arrow has with the rest, minimizing the negative effects of any movement you might have had during your shot. The most important tip we can give you to improve your accuracy is to stay calm and relax. While archery can be a competitive sport, remember that it’s a hobby you engage in for fun, enjoyment and release of stress. If you teach your body to stay relaxed and natural when shooting, you won’t experience any of the subtle problems that stem from tension. Unless you’re preparing for the Summer Olympic games, keep the game fun and you’ll find yourself a better shooter in the end for it. 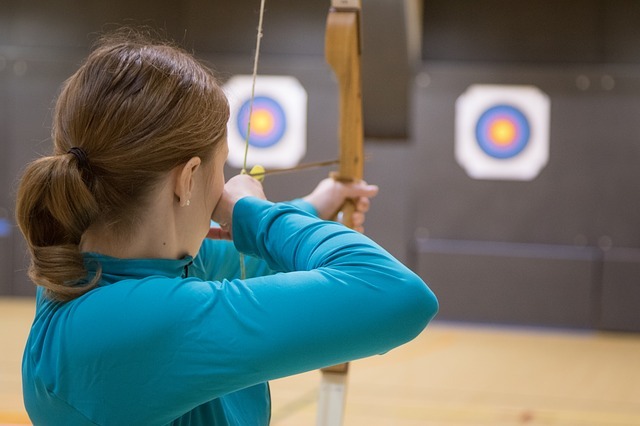 Whether you’re just getting your feet wet with archery or you have been shooting for years, our experts can always help you to improve your shot accuracy. Contact us today to get started and hit that bulls-eye!